Engineers at Sandia National Laboratories, along with partner institutions Georgia Tech, Bucknell University, King Saud University and the German Aerospace Center (DLR), are using a falling particle receiver to more efficiently convert the sun's energy to electricity in large-scale, concentrating solar power plants. Falling particle receiver technology is attractive because it can cost-effectively capture and store heat at higher temperatures without breaking down, which is an issue for conventional molten salts. The falling particle receiver developed at Sandia drops sand-like ceramic particles through a beam of concentrated sunlight, and captures and stores the heated particles in an insulated container below. The technique enables operating temperatures of nearly 1,000 degrees Celsius. Such high temperatures translate into greater availability of energy and cheaper storage costs because at higher temperatures, less heat-transfer material is needed. Central receiver systems use mirrors to concentrate sunlight on a target, typically a fluid, to generate heat, which powers a turbine and generator to produce electricity. Currently, such systems offer about 40 percent thermal-to-electric efficiency. The falling particle receiver enables higher temperatures and can work with higher-temperature power cycles that can achieve efficiencies of 50 percent or more. "Our goal is to develop a prototype falling particle receiver to demonstrate the potential for greater than 90 percent thermal efficiency, achieve particle temperatures of at least 700 degrees Celsius, and be cost competitive," said the project's principal investigator, Sandia engineer Cliff Ho. "The combination of these factors would dramatically improve the system performance and lower the cost of energy storage for large-scale electricity production." The project is funded up to $4 million by the Department of Energy's SunShot Initiative, which aims to drive down solar energy production costs and pave the way to widespread use of concentrating solar power and photovoltaics. Falling particle receiver technology was originally studied in the 1980s, and Sandia researchers are working to address challenges that hindered greater acceptance of the concept. Among the issues are mitigating particle loss, maintaining the stability of falling particles, increasing the residence time of the particles in the concentrated beam and reducing heat losses within the receiver cavity. Ho and his colleagues at Sandia have been working to address these issues by studying the effect of an added air curtain, created by a series of blower nozzles, to help particles fall in a stable pattern and reduce convective losses. 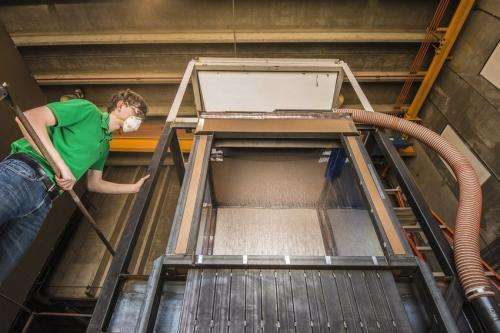 Adjusting the particle size and how sand is dropped has also helped, ensuring more of the sand gets heated in a pass and makes it to the collection bin at the bottom. Researchers are also investigating the benefits of using an elevator to recirculate particles through the aperture a second time to increase their temperature. "Given our unique facilities at the National Solar Thermal Test Facility, we have the capability of developing prototype hardware and testing the concepts we've simulated, which include innovations such as air recirculation and particle recirculation. Advanced computing lets us do complex simulations of the falling particle receiver to understand the critical processes and behavior," Ho said. "We're very encouraged by our progress and look forward to further developing this enabling technology." Falling particle receiver technology is expected to lead to power-tower systems capable of generating up to 100 megawatts of electricity. The project is in its first of three years, and a test-ready design is expected in 2015.